Although most restaurants have become more conscious of adding healthy menu items or offering fewer dishes perceived as unhealthy, you’ll still find deep fried entrees on the carte du jour. It’s hard to resist a heaping mound of crispy, golden french fries or beer-battered southern fried chicken! If you have a hamburger on the menu more often than not it is accompanied by some form of deep fried goodness. It doesn’t take a lot to make fried fish or onion rings taste delicious but it also doesn’t take much for them to taste inedible either. The number one priority of restaurant owners and operators is to make sure the customer is satisfied with their meal. Their second priority is keeping food and operating costs low. The oil used in deep fryers is not only responsible for making fried food mouthwatering, it’s also a HUGE operating expense. To ensure the flavor of fried food is never compromised and the cost of shortening remains low, it’s absolutely necessary to filter your oil! We’ve already established the importance of filtering your fryer oil: assuring food quality and reducing operating costs. But what choices are there for filtering? The least expensive way to filter oil is to use a grease filter cone rack. These are perfect for restaurants and bars that only have a few fried items on their menu. All that’s needed is a grease filter cone rack, grease filter cones, and a large stock pot. To filter the oil, insert a grease filter cone into the rack and then place the rack on top of the stock pot. Fryers have a drain valve in front of the unit. Attach a separate hose or over-flow pipe to the drain valve and gradually let the oil run through the filter cone into the stock pot. 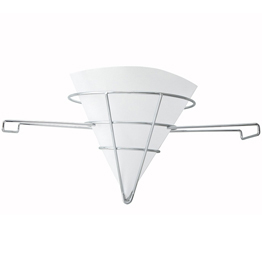 The paper filter cone will collect crumbs and food particles that can cause unwanted taste transfers. By reducing the number of contaminants in your shortening you’ll also maximize the life of your oil. Not only will your fried food taste better, you’ll also get more use out of your expensive oil! 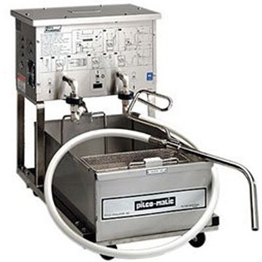 For high volume restaurants that primarily offer fried menu items it’s probably necessary to buy a portable fryer filter machine. When using a fryer filter machine you simply roll the low-profile, portable unit under the fryer’s drain valve and slowly drain the oil from the fryer into the filter. Once the oil has been filtered, a return hose then pumps the oil from the filter back into the fryer’s vat. There are also fryers that have built-in filtration systems installed by the manufacturer but they are often expensive and unnecessary for Mom and Pop restaurants. Of course, oil has to be replaced regularly, but to enhance the taste of your fried food and reduce operating expenses it’s important to filter your oil weekly if not daily. For more information about fryers, portable fryer filter machines, and grease filter cone racks visit Mission Restaurant Supply!